Royal Posture Review - Does this Cheap Brace Work? Established in 2015, BulbHead is a unique online retailer. Their business model involves crowdsourcing customers (called “BulbHeads”) to help them invent new ideas into marketable products. In a sense, their customers are their research and development team! The company’s revenue comes from innovative inventions created from the ideas of their customers, and this is one of the reasons why BulbHead has become a leading online retail brand in the United States. BulbHead doesn’t specialize in any area in particular; they develop and sell products in a broad range of categories such as home and garden, pets, kids, beauty, and healthy living. Each successful product they develop via their crowdsourced customer base gets sold on their online store, but also through other retailers such as Amazon and Walmart. The Royal Posture by BulbHead is a posture corrector product that aims to align your spine and correct your posture. Sold in Walmart and online through retailers such as Amazon, the Royal Posture is one of the cheapest correctors on the market. Large/extra large – 37-inch to 58-inch waist, waist size 18-38. The Royal Posture is only available in tan, although the color shouldn’t be much of an issue to given that you wear under your clothes. The brace is made from a mixture of 70% neoprene (a type of synthetic rubber), and 30% polyester. Although some retailers describe it as a support belt, the Royal Posture is more like a thin vest which fits discreetly underneath your clothing. One advantage of this back support is that it’s also easy to put on by yourself; thankfully, you won’t need to ask for assistance whenever you wish to wear it. There are just eight simple steps to wear the Royal Posture, and it’s adjustable with tightening straps at the upper rear section of the brace. Although it might be tempting to wear it a little loose for a more comfortable fit, it should be as tight as comfortably possible to have maximum impact. The instructions suggest that you could wear a fitted T-shirt underneath the Royal Posture for additional comfort. One of the questions that people often ask about the Royal Posture is “how long does it take to work?”. According to BulbHead, most people tend to see results after around two weeks of consistent use. After reviewing ten or more posture supports, I decided to try out the Royal Posture. While the reviews of the product can be described as mixed at best, I thought I’d try it out and see how well it worked. I put it on before taking a trip to the grocery store. I didn’t want to wear it all day as some people complained about the straps being painful after a while, so I decided to test-drive it for an hour while grocery shopping. I noticed good posture support right away but felt that shoulder strain may be an issue. During my trip out, it pushed against my upper neck. I came to the conclusion that I probably had it on too tight. I didn’t want it to be loose, as that would render the product pointless. I think the design of the brace might be an issue for some people (including me). Because the design puts pressure on the back of the neck, it can reduce the effectiveness of the brace. Over time the soreness was unbearable on my neck. I would say this is more like a product that “reminds” you to stand or sit up straight rather than something that will miraculously help your back pain or medical conditions. I would also recommend that anyone buying the Royal Posture use it for short periods. It makes sense to wear it less than an hour at a time because the straps can come loose. You’ll find it uncomfortable after long periods, even if you wear a T-shirt underneath it. The old saying “you get what you pay for” rings true here. For the price, you can’t expect miracles from the Royal Posture! While users of the product have mixed opinions if you wish to have a cheap brace that you wear for short periods of time the Royal Posture may be for you. What do buyers think of the Royal Posture back brace? Online reviews of the brace are mixed. For example, one female buyer that is suffering from scoliosis says that it works well for her. But, the disadvantage is that the strap going around the armpit can hurt after a while. She did suggest that wearing a T-shirt underneath seems to cure the problem; something BulbHead also recommends if you find it painful to wear after a while. 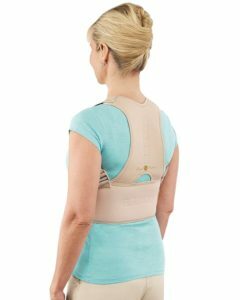 In fact, quite a few buyers experience the same issues and have to use the same workarounds if they wear the Royal Posture back support brace for long periods. On a more positive note, one customer said they noticed an improvement in their spinal alignment and even muscle relaxation after one week’s usage. Another stated that they used to have back pain in the evening until they started wearing the Royal Posture back support brace. The mixed reviews could put some buyers off it. It’s not possible to put the Royal Posture in your washing machine along with other garments. You can hand-wash it with cold water and hang it out to dry somewhere. The brace cannot be put in your dryer, so you’ll need to wait for it to dry naturally. The Royal Posture support brace won’t perform any miracles on your back. But, for the price, it’s an excellent idea if you only want support for a few minutes a day while sitting down on a chair or at a desk.